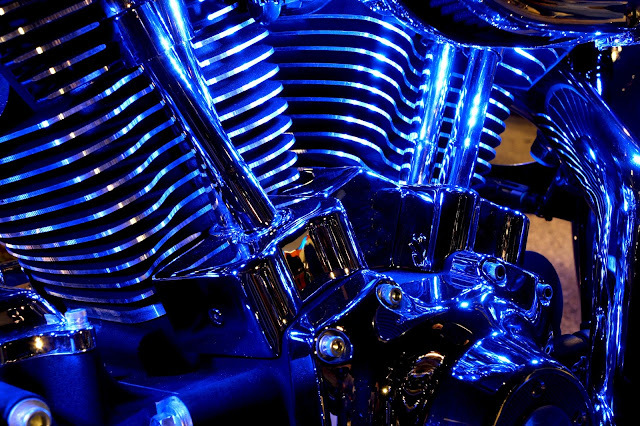 Texas is the second largest motorcycle-owning market in the U.S. and many riders have embraced the use of LED lights to make their bikes show up better at night. However, until recently, the relevant state law was ambiguous at best regarding the legality of these lights and was open to interpretation by individual law enforcement officials. State Senator Kirk Watson is an active motorcyclist and saw an opportunity to ensure motorcycling was safer for riders by clarifying the legal verbiage during the recent legislative session to ensure certain types of LED lights are legal for use with bikes in Texas. Initially, the law prohibited the use of lights brighter than 300 candlepower (CP), could not project a beam more than 75 feet, do not flash, were not red, nor directed from the center part of the vehicle. Further, the application of the law was subjective to each law enforcement official. The debate on this issue could be found going back to 2011 on discussion forums online and with little clarification on what was legal. When Sen. Watson got involved due to a suggestion from a constituent, and he quickly saw the need to clarify the verbiage. Effective September 1, SB1918 passed to add TRC 547.306 which directly addresses the use of LED lights on motorcycles. The ground below the motorcycle. A person may operate a motorcycle equipped with LED ground effect lighting that emits a non-flashing amber or white light. The ability for a motorcyclist to safely use white or amber LED’s is an important factor as the failure to see a rider is frequently stated as a main cause with wrecks involving motorcycles. In fact, according to the 2013 data from the Insurance Institute for Highway Safety (the most recent numbers available), approximately 25 percent of all fatalities involving a motorcyclist occur between non-peak traffic times of 9:00 p.m. and 6:00 a.m.
Watson whole-heartedly embraced the initiative to clear up the law after hearing from concerned riding constituent, Theodore Cody who had researched the previous law after hearing from other riders about harassments they had received from law enforcement over the use of LED’s. Cody then turned to the state senator, a rider who himself recently rode more than 3,000 miles on his Harley-Davidson to attend the 75th anniversary of Sturgis Motorcycle Week yet he rarely rides his bike after sunset due to safety concerns. “This is a great example of a constituent calling something to my attention,” said Watson. “A motorcycle rider in my Senate District contacted my office pointing out the obvious safety benefits of allowing motorcycles to have more lights on them at night. However, he also noted that the law was ambiguous so some riders were receiving tickets, especially if the lights made their bikes look like emergency vehicles. We worked with the Department of Public Safety to assure that riders seeking safety wouldn’t run afoul of the law and put it into legislation. Honestly I don't see why it maters what color is on so long as they are not flashing/strobing. The same needs to apply to cars & trucks! I am seeing more vehicles changing the color of their side markers and tail lights. Example, I thought it was always a law to have side markers Amber not white, green, or red as I've seen. While there is good intent, it immediately made many bikes 100% illegal to use the other color LEDs that they have already installed, though technically legal when they paid to do it. Now they can either not use what they paid for, or have to pay again to have the LEDs changed out. Instead of specifying colors (as noted by a previous post), why not just say they can not be flashing. I have never confused a motorcycle with red or blue accent lighting for a police bike.